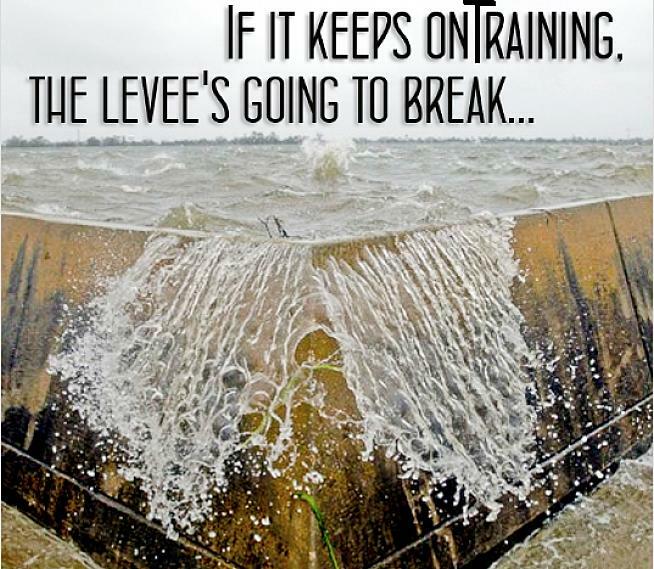 "If it keeps on (T)rainin' levee's goin' to break ..."
Now it's getting near that time of year when many of you will have been training, racing and riding pretty hard for a long time. Many of you start your training in November in readiness for those April to May early season races and events. You may then have taken a mini break, but then launched right back into training for a new summer peak, maybe even a third in September. This reminded me of a song by arguably the best band ever to have existed, Led Zeppelin. Now substitute the words rainin' with trainin' and my little variation starts to make some sense right? Think of fitness as adding water behind a dam. The more water you add the more strain the dam is put under. The dam is analogous to your body. The more training you put behind it the more strain it places on your body and the more likely it is to break. Every year we need to open the gates and let some of that water out to ease the strain and let the body become strong again. The race season is now coming to an end. The gran fondo season is slowly grinding to an end although there seems to be more and more late season events encroaching into the middle of October. This is a shame as it tempts you to continue to train for far too long and not give yourself enough rest and recuperation time. October is traditionally called the 'off season'. This is a time of year where you take time off from hard training and get yourself mentally and physically prepared for next season. Now I am not advocating taking a whole month off slouched on the sofa eating Krispy Kremes and gaining10 lbs, however you really do need to let go of some of your hard-earned peak fitness. Trying to maintain it will not make your next season's results any better - it will make them WORSE. It simply isn't possible to be in top shape every week for the entire year. Trying to do so will likely lead to mental burnout, injury or illness and could lead to full blown overtraining. Not a good place. Now I understand that for the really dedicated amongst you this is going to be REALLY HARD. But please believe me it is a really important part in the preparation for next season. In order to build back to new fitness peaks you have to allow your fitness to FALL in the off season. I like to see Critical Training Load (CTL) fall to somewhere between 45-55 for well trained athletes - about half where their season peaks have been. Now that is PRETTY SCARY right? Losing 50% of fitness! But wait a minute - what does 50% of fitness really mean? If you keep riding some nice easy rides in October then your endurance fitness will remain rock solid. But by cutting out MOST of the intensity you will lose a little race sharpness, but who cares unless you are racing CX, as it's out of season. Believe me when I say that this is one of the most important periods in your training year. I have seen people try to maintain CTL's of 80-100 all year and it always ends badly. So please abandon the idea of staying in race shape all winter. Instead, decide when it is you want to have an excellent level of fitness in the coming season. It will probably take you something like 24 weeks to get back to to race shape so if you have more than six months until your next A-priority race relax your training for a few weeks - 2-6 weeks is a good period of time. It does not have to be in October either. For some, December is a better time, especially if their target events and races are in the summer. If you are racing CX or MTB then your off season should be in February or March (not bad months to take a break!). By all means continue to take regular exercise but make sure that there are days of DOING NOTHING. A little intensity for us older riders is also a good thing as it keeps those top end energy systems alive and keeps those harder efforts close at hand. AVOID other athletes who keep training hard. You know the type. They are doing intervals and hard group workouts when it doesn't count for anything. They are the turkeys at Thanksgiving and won't be jumping like spring lambs in May. Be creative with your exercise. Do something different from what you might normally do. I try and rekindle my old passion for surfing while the water is still nice and warm and the Autumn swells are often good. I also get back in the gym twice a week and start my adaption phase for the heavy weight lifting that is to come. Just do something different and HAVE SOME FUN! Training should be about delivering performance when it counts. Rob Wakefield is a fully qualified Level 3 Cycling Coach with the Association of British Cycling Coaches and founder of Propello, a cycling focused health and fitness business delivering Performance Training Programmes and Bespoke Coaching to cyclists anywhere in the world. All cyclists who are looking to improve their speed, endurance or strength will benefit from a structured training programme. Propello Training will improve how your muscles, lungs and heart work and will enable your body to transport and utilise fuel effectively - making you faster and stronger for longer. Click here to learn more about Propello.